Home › Email Scams & Phishing › Omniquad Highlights New Tesco Scam Email – This time it is your Credit Card details you must update – yeah right. Omniquad Highlights New Tesco Scam Email – This time it is your Credit Card details you must update – yeah right. Tesco customers are really targeted these days. The current flow of phishing emails informs you that they have updated your credit card details, you just need to log in and verify. Do not fall for this scam please, it is never a good idea to click in links in emails and giving your credit card details away- for scammers, it is like stealing candy from babies. Really easy. The messages purporting to come from Tesco claims that “ we have successfully updated your Tesco bank credit card with the contact details you gave us”, and asking the user to click on the link provided in the email and verify credit-card account details. The email is not from Tesco. The “click here” link in the message opens a bogus website that asks users to supply their Tesco account login details along with their email account information. This information can be collected by scammers and used for bank fraud and identity theft. The scam email was originated from the United Kingdom. Omniquad successfully blocks these fraudulent links with the Surfwall Remote web security service, and protects its users. 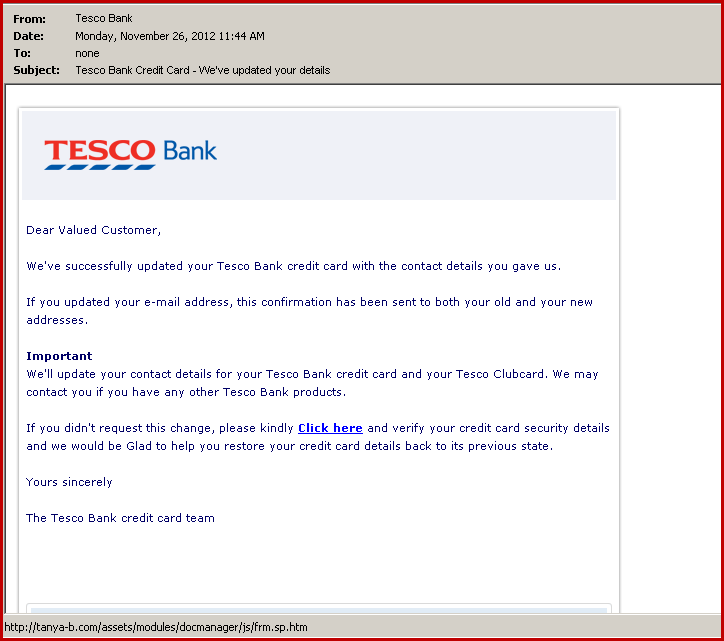 Read our earlier blog post about the previous phishing scam involving Tesco: You have won £2000! Protect yourself from email fraud. Our top tip to stay safe and avoid being scammed? Look who the email is addressing! “Dear Valued Customer, ….” The scammers dont know who the recipient of their emails are, they spam out emails using a scatter gun approach, hoping they will hit somebody who banks with Tesco and will be fooled by their scam. Legitimate emails from financial institutions will most likely address you by your name. « Omniquad highlights Spam of the Week: Local Arrest Record Now Posted Online – Find Child Predators in your neighborhood!